The San Diego Aviators overcame losses in men’s and women’s singles with a one-sided victory in women’s doubles, then fought off three match points in mixed doubles to defeat the Boston Lobsters, 21-19, Saturday in a World TeamTennis match at Valley View Casino Center. Daniela Hantuchova and Kveta Peschke’s 5-1 victory over Megan Moulton- Levy and CoCo Vandeweghe gave the Aviators a 17-14 lead entering the mixed doubles. Moulton-Levy and Eric Butorac then took a 4-1 lead over Peschke and Raven Klaasen, tying the match, 18-18. Boston (0-5) had three match points in the sixth game of the set, but the Aviators won that game and the next before the Lobsters closed out the set, winning 5-3 and forcing overtime. 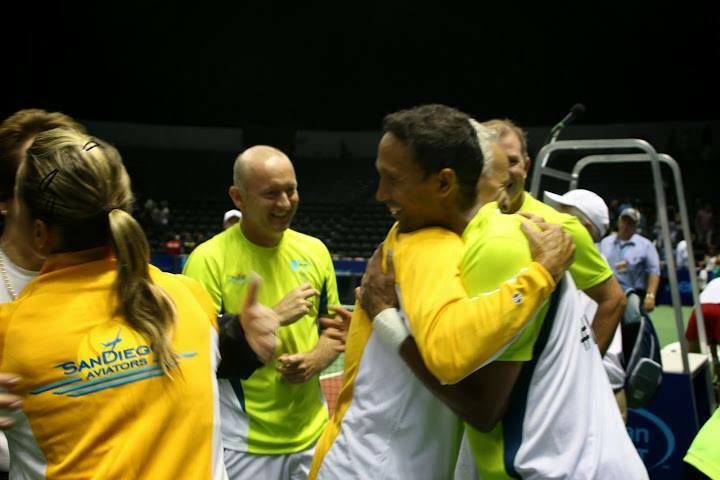 Under World TeamTennis rules, if the trailing team wins the final set, the match continues until the leading team wins one game or the trailing team ties the match. The Aviators (3-2) won the first game of overtime to end the match. The Aviators lost both of the first two sets. Somdev Dewarman fell to Rik de Voest, 5-3, in men’s singles, and Hantuchova lost to Vandeweghe, 5-4, in women’s singles. The Aviators got their first victory of the night in men’s doubles as Dewarman and Klaasen defeated Butorac and de Voest, 5-3, cutting the deficit to 13-12 at halftime. The Aviators will begin a six-match road trip Sunday. Their next match at the arena formerly known as the San Diego Sports Arena will be on July 20.